I've got two Girl Guide projects on the boil at the moment. And for this reason I've become a somewhat compulsive eBayer, trawling for interesting ephemera that might make for good illustrations. I've now got a giant box of Guide books, photo albums, camp diaries, badges, certificates, letters, application forms, even an original belt. 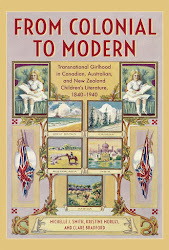 Here's hoping a book results or I'm going to have a busy time relisting a hundred back issues of the Waratah (New South Wales Girl Guide magazine) from the 1950s. I've also nabbed a few fairly scare weekly issues of the Girl's Own Paper with their advertisements still intact. Anyone working in this area knows that advertisements were usually removed for libraries and binding into annuals. I've only ever seen advertisements from this magazines contained in a Library of Congress microfilm, which include issues from the early twentieth century. The copies I found are from the 1880s, the earliest years of the paper. 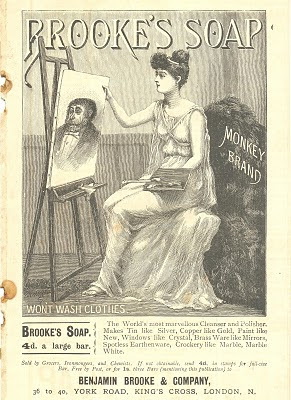 Some contained additional fold-out ad booklets, usually for soap, including the pictured advertisement for Brooke's Soap, which I think became well-known as Monkey Brand soap. I've been reading Anne McClintock's article on the history of soap, and she mentions mirrors, soap, light and white clothing as the four domestic fetishes of the period. In this image, we've got a kind of mirror in the form of the artist's canvas, but it's depicting a humanised monkey that the girl has proudly painted. As I'm intending to write a paper on Tarzan in light of Victorian popular understandings of social Darwinism, I'm not sure what to make of the monkey in the suit. Can he be humanised and civilised like native peoples with the influence of femininity and whiteness? But what on earth is that giant furry thing on the girls' chair? An animal skin? If so, is there a reversal of the monkey in the tuxedo with the idea of the girl in the monkey's fur? A strange one, that's for sure!